With his back problems now behind him, Vincent Zhou is looking forward, not backward at what might have been last season. The 17-year-old California native is aiming to get back on track at Skate America next week after his season opener did not go quite as planned. Lori Nichol choreographed his short program this season. Zhou said working with her was “quite an experience. I had never really had such a connection to music and movement before working with her, so it was such a great opportunity to have her expertise. 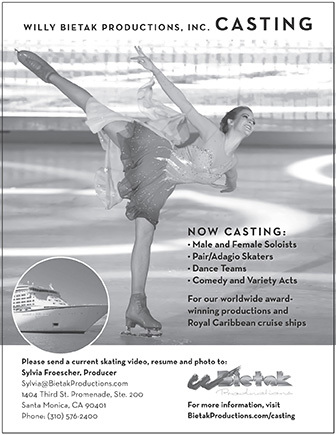 She has so much experience working with world-class skaters. Just choreographing the program was quite an experience. “The music (“Exogenesis: Symphony Part 3” by Muse) is a piece I have always liked. It was not the first thing in my mind but as I was sitting with Lori and discussing ideas it popped up. There is a really moving animated video to the song that makes me feel something. I felt that the program would come out with true emotion. “I showed it (the video) to Lori and she was a little surprised. After I suggested it, she sort of had a fresh perspective, with new ideas coming along. We tried it out and we also tried out some other pieces. In the end when we got done, this just worked the best. We finished the program and it turned out so well. When asked what he worked on over the summer to improve his component scores, Zhou admitted he had a mental reset after the Olympic Winter Games. “The best way I could get enough points to make the Olympic team was going for all the quads (at nationals). But during the offseason, after doing some shows and choreography and putting extremely low emphasis on pumping out 100,000 quads a day, my skating was naturally able to improve. “I have always found that my ability to improve is surprisingly fast. Once my body is healthy I am able to go from not skating for a month to full-out programs in just a couple of days. I had time during the summer to let my skating get better, and let my skating into jumps look a little more connected. “During my back injury I was able to spend some time being able to skate without jumping and that allowed me to put more focus on the other things. Maybe the back injury was a blessing in disguise. I have made it pretty clear to my team that I don’t want it to be all about jumps this season.